A lot of (or most) businesses I speak to struggle with unpredictable and/or unstable cash flow. As an entrepreneur for almost 30 years I can totally relate to that. Iv’e been there many times. The fear of not knowing if you can pay your bills, salaries, taxes etc is painful. One of the main reasons for that problem is that most people don’t like selling. I have read a survey saying 97% of people are uncomfortable with selling. And the thing most people really dont like is prospecting and cold calling. Well if you ever felt like or experienced that your’re not alone. A 2016 survey made by Small Biz Forum on LinkedIn covering 1300 small business owners showed that 88% of business owners struggle to maintain consistent cash flow. So what is the difference between the 88% who struggle with cash flow and the 12 % who don’t? Almost all of the 12% who don’t struggle with cash flow said that they have systems in place to consistently bring in new prospects, appointments and clients. In this article you will discover one system that can help you with that. For this to work you need to be willing to advertise. The name of the article kind gives it away, but I still think it’s worth pointing out. This is for businesses, both offline and online, that struggle with increasing sales and profit. It is especially for those that don’t like or are good at selling in business categories that need to use a bit of convincing to land a new client. What do I mean by “business categories” that need to use convincing? There are three categories of businesses when it comes to turning advertising into profit. The method or turning advertising into profit works for all three categories. There are however some differences in what systems (or funnels) that we use for each category. In this article I will describe a system that works for all categories. Let me just say that Category A can use a simper version than the one I will describe here. Free download: Get this article as a PDF now so you can implement the system quickly and easily. Before we start, I just want to remind you of something you most likely already know, but it’s crucial to bear in mind as we go forward. I will show you how your advertising cost will become a Variable Cost instead of a Fixed Cost. This is important because a variable cost only arises when you sell something. That means your advertising spending will be in direct correlation to your sales. The more you spend on advertising the more you will sell. You can compare it to having a vending machine vs a slot machine. Traditional advertising is like having a slot machine. You put money in hoping that you will win. Hoping that someone will remember you. The theory is that the more you put in, the greater the chance of winning or in this case being remembered. The problem with this is that it’s not predictable. You don’t know how much you need to spend for it to work. The how to turn advertising into profit method on the other hand is like having a vending machine. You put money in and know what’s coming out. You know what you’ll get. For example you put money in and out comes an apple or whatever you chose. It’s very predictable. Now imagine if this was your marketing. You spend money and know what you will get in return. Well you’re about to find out exactly how you can do this. Before I reveal how to turn advertising into profit there are a few more things you need to know. Why does someone buy from anyone? People buy from someone for three reasons. The keyword here is trust. People don’t buy from you if they don’t trust you. If they don’t trust that you can deliver the result they want, they won’t buy from you. Just recall how you react… Would you buy something from someone you don’t trust? When you don’t trust what they say is true? So how do we get cold prospects to trust you and become hot leads? I will show you right here the foundation of it. It’s often called a marketing funnel or sales funnel and here it how it looks. Below is a visualisation that shows why it’s called a “funnel”. The basic idea is that after each engagement some people drop off and some move down the funnel. Here below you see an example of a marketing funnel mapped out. What this is all about is building trust with micro conversions. Step by step you need to get them to know, trust and like you. There are several ways of doing this. One of the best ways is by giving them free relevant information about the problem you solve for them. You give them some results before they buy. You give them free information in form of articles, blog posts, videos, pdf downloads, webinars etc that solves their problem (in part or whole) or answer a question. That’s how they will really get to know, like and trust you. Now I hear you ask. But how do I get people to find my information? In short, what you do is that you advertise the information, the content, (that is not selling anything). When the person comes to your website to consume the information, the advertising platform will put a little code on them, to remember them, so you can remarket to them. It’s called remarketing. This way you will build a targeted audience interested in your offer. Now you can target ads just to those that visited your website and consumed the free information. I will show you a Content Amplification funnel that you can implement immediately that works very well right now. You start by having 1-5 articles written that each solve a problem or answers a question for your target audience. You can outsource this on places like Freelancer.com, UpWork.com or Fiverr.com. You also need some images and graphics to enhance the content. This can be outsourced as well. Blog graphics like the one on top of this article you can have made on Fiverr.com for $15. Then you publish these articles on your business blog section of your website. Next you advertise the articles to your target audience. There are several channels you can use to advertise. Two of the best places to start are Google Display and Facebook. Both of these will let you target people by interest, geography, demographics etc. They will also let you build a remarketing list (Facebook calls it Custom Audience) of the visitors to your article page. Pro tip to get instant leads. You can offer what is called a “content upgrade” to the people reading the article. What this is, is basically that you ask if they want to download the article as a PDF. When they click the link to download, a box pops out for them to enter their email address where to send the PDF. You’ll be surprised how many people actually do this. Very often 20-30% of the readers. After they read the first article they are a bit warmer. That’s when you start the next step, you ask them for something. It’s still free. It might be to attend a webinar or download PDF and in return you get their email address. Now you have taken them to the next step. Again it’s called micro commitments or micro conversions. Then you can start sending them an automated follow up email sequence with some recommendations or soft pitches. You can even ask them a question in an email. “Is there something I can help you with?” You will be amazed how many people will reply to that. Then you engage in a conversation with them on one-on-one basis. Once they opt in, on the thank you page, you can also offer something to buy as a special deal and you can make some money immediately. This is a rinse and repeat model you can do over and over again. 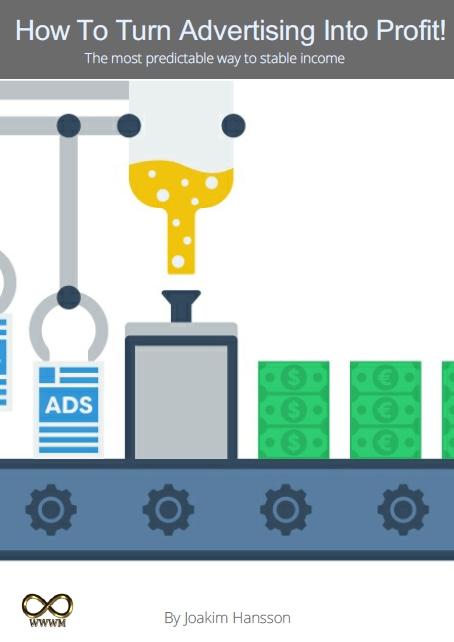 With proper tracking in place you can track from what ad your customer or lead comes. This is the beauty of Digital Marketing. We can track and measure everything. And if you don’t track you don’t know what ads and campaigns are profitable. You can use Google Analytics (it’s free) to do this. The most important number is Cost Per Acquisition called CPA. This is the total cost of your advertising to get a new customer. When CPA is higher than your profit margin on the order you have a winner. Then you test and tweak to get 2x, 3x, 5x or more return on investment. Cost Per Lead – CPL is good to track especially if you sell offline. You can then start to manually track how many leads become customers and then also calculate your CPA. When you have a funnel that generates more profit than you spend on ads, you have your own money printing machine. Go put this in place for your business today. If you want a step-by-step system to follow or want help to implement this for your business, we have three different options how we can help. Enter the email address where to send the PDF version of the article.